Viola graduated from Syracuse University with a BFA in experimental studies. After graduating he worked as a video technician while creating art. Shortly after he moved to Florence, Italy to work at a video studio where he met other video artists Nam June Paik and Vito Acconci. In 1980 he moved to Japan for a year and a half to study Buddhism with his wife. His time in these two countries contribute to the Eastern and Western influences in his work. Viola’s work Moving Stillness: Mount Rainier 1979 (1979) employs water as a metaphor for human consciousness. This piece was pioneering for its use of water and video and sound recordings of nature. While experiencing the piece and listening to the gurgling water sounds and distance thunder and lightning, I found myself thinking about what it is like to be out in nature during a storm. A beautiful image of Mount Rainier was projected on the screen that would get disturbed periodically when the water was disturbed by the attendant. The Sleepers (1992) is a mysterious piece involving seven 55-gallon drums in a dark room. 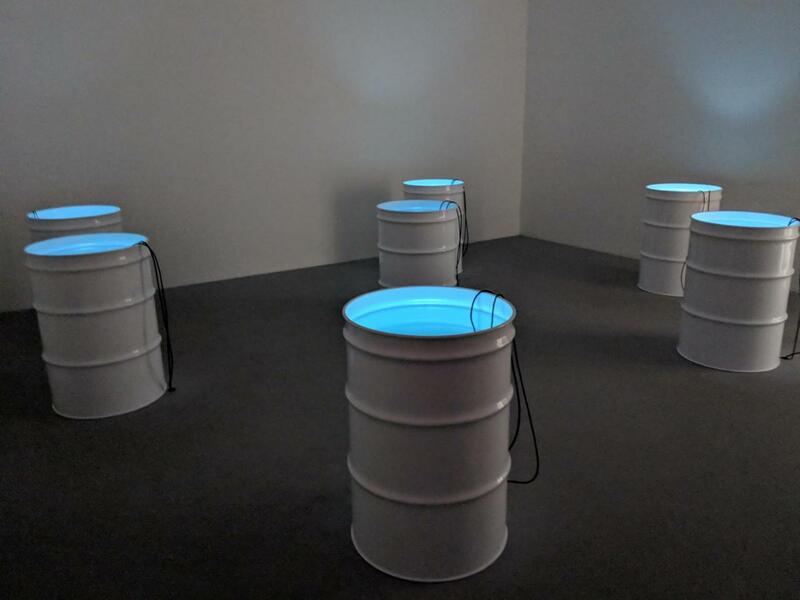 When I entered the room I was intrigued by the blue light emanating from each barrel. I was compelled to move closer to see what was at the bottom but was also concerned about what I might find. I was relieved to see the light was coming from videos of sleeping people but also saddened by the idea of the loneliness of being asleep at the bottom of a barrel of water. The sleeping people were isolated from the viewer and each other. The video artist Bill Viola is a pioneer in his field. He creates works of art that address the major themes of human existence such as birth, suffering, death, and human consciousness, using water as a tool for artistic expression. Louisiana Channel. “Bill Viola Interview: Cameras are Soul Keepers.” Online video clip. YouTube, 18 Apr. 2013. Web. 25 Mar. 2018. Wikipedia contributors. “Bill Viola.” Wikipedia, The Free Encyclopedia. Wikipedia, The Free Encyclopedia, 20 Mar. 2018. Web. 25 Mar. 2018. James Cohan Gallery. “Bill Viola Moving Stillness.” 22 Feb. 2018. Print. 25 Mar. 2018.